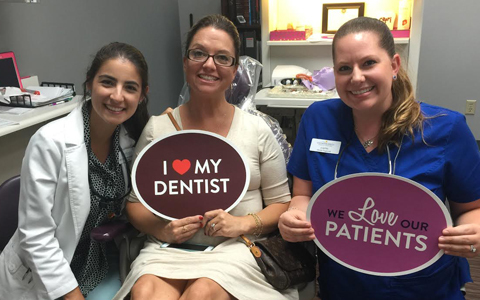 Olympia Hills Family Dental aims to provide you with the very best dentistry care available and is suited to meet your individual needs. We can help you replace missing or severely damaged teeth with removable dentures. But if you’re looking for a more permanent solution that gives you the performance and aesthetics of natural teeth, you’ll want to learn more about dental implants. Our dental implants are designed to last much longer than dentures—sometimes even a lifetime! How do we do it? Removable dentures have to be replaced every few years because they are designed to cover up the space where your teeth once were. Implants, on the other hand, are designed to mimic the natural formation of your teeth by bonding a root replacement to your jawbone and covering that with a dental crown. This leaves a much more secure and permanent replacement that can withstand years of use! Because implants are designed to be a permanent solution to missing teeth, you can treat them just like your natural ones. Purchasing denture dental hygiene products such as cleaners or adhesives (which are quite expensive) are unnecessary. Simply purchase floss, a toothbrush and toothpaste, and you’re all set! Many patients don’t realize that when you are missing one or more teeth, the remaining ones tend to shift or weaken due to the increased stress caused by picking up the slack from missing teeth during eating and talking. In addition, your jaw will start to deteriorate and alter your overall facial appearance. Our dentistry team often suggests dental implants because they mimic both the form and function of a fully organic smile, giving you a stronger bite and a better overall look than non-supported dentures. Unlike dentures, which can slip and slide even with adhesive, implant-supported dentures and dental implants are stable 24/7. This means that they allow you to enjoy a wide variety of foods that you would not be able to attempt to eat with traditional dentures. There are no limitations! You will be able to chew your food normally, improving both the taste of the food and your ability to maintain a healthy, nutritious diet with a larger variety of foods. We often suggests implants over dentures because they allow for more natural sounding speech. You won’t have to worry about slurring or mumbling because your denture appliance slipping or sliding. Dental implants will allow you to speak clearly again. When you lose a single tooth, your jawbone shrinks because there is no root to hold it in place. Losing multiple teeth in one area can shrink the jawbone substantially, leaving your face looking much older. With implants, you don’t have to hide your smile due to fear that it looks unnatural or out of place. Dental implants are well-anchored and designed to be indistinguishable from your natural teeth. With this replacement option, you can have your smile and your confidence back. So what are you waiting for? If you’re ready to restore your overall appearance with your Universal City, TX, dentistry team and dental implants, schedule an appointment online or call us at: 210-658-3131.